A dark beauty who held a 19 micron at age 9! 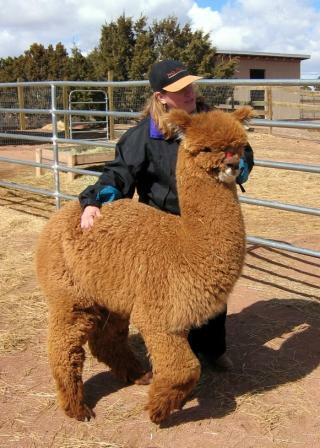 Vito has a fine bright fleece, butter soft with crimp from his nose to his toes. He has magnificent coverage and a density that is really remarkable. He has stunning conformation and a gorgeous, typey head. He also is a gentle soul with a sweet disposition. Vito uniformly throws his density and well organized lock structure. We have a splendid variety of colors in Vito offspring - he tends to throw the dam's color although not in every case and he throws that teddy bear head about 50% of the time. 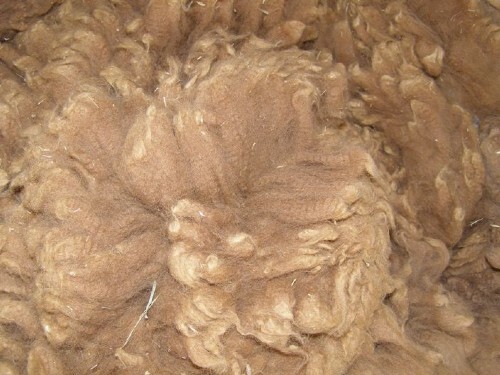 All of the offspring I have seen have his very correct conformation and "nose to toes" fleece coverage and...well...we just have an awful lot of satisfied customers. Vito had a very successful show career. 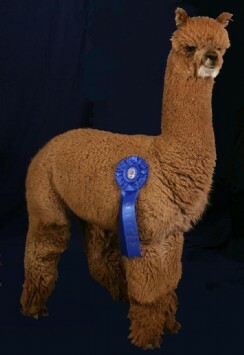 He never placed lower than third in any halter class he entered and never lower than second in the two national fleece shows he entered. 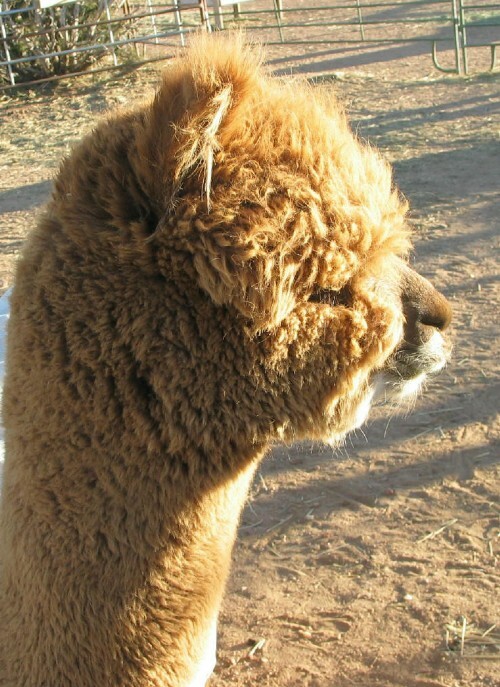 His fleece shorn at 66 months was awarded Color Champion at the prestigious Great Western Alpaca Show in Denver (May, 2010) The judge commented on how well he is holding his micron as well as how well structured and consistent his fleece is. Most recently at the AOA National Fleece Show, he was awarded 19 out of 20 points for fineness and handle on a fleece shorn at eleven and half years! Still winning ribbons after all these years. Show information is available here as well as through the AOA web site. When using show results as a criteria for choosing stud services or purchases, we strongly encourage you to consider the whole equation. Look at the size of the show, the level of experience of the judge(s), the size of the class in question and the show experience of the other breeders competing in the class. Not all blue ribbons are created equal. We are very proud of Vito's show record, but he has a second place ribbon that I am just as proud of as all of his championship ribbons. 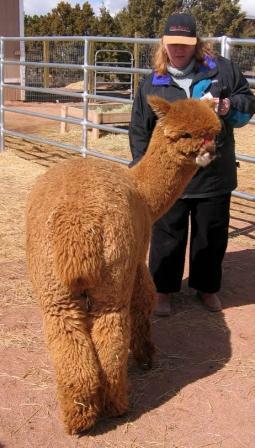 Show results should be considered only one tool to be used in judging the quality of any alpaca. The posted breeding fee is for full service on-farm breeding services and includes 90 days free board for your female, and ultrasound confirmation of the pregnancy. Drive-by breedings are available for $1000, pregnancy testing is the responsibility of the dam owner. Half the breeding fee is due upon arrival of dam. Balance is due upon pregnancy confirmation or 60 days from last breeding. Age Class E - he was twice the age of the other entries at eleven and half years of age - received a score of 19 out of 20 for fineness and handle. Installment payments can be arranged for qualified customers. We also accept all major credit cards.